Aged care interior is usually a very interesting and challenging project. There are some specific considerations to be made when designing it. 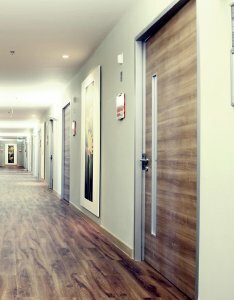 Aged care facilities need to be designed to be homely, welcoming and with attention to practicality and functionality. Interior design principles which need to be considered when it comes to aged care facilities include accessibility, layout, flexibility, and creativity. Modern aged care service providers are moving away from the sterile designs of old and are looking to more cutting edge designs with beautiful, functional interiors and attention to community, aesthetic design, and connection with the outside world. From aged care apartments and villas to hostels and nursing homes, there are some key considerations to be made. 1. Accessibility. Space to move is crucial in any aged care facility. There needs to be plenty of room for walkers, wheelchairs, and room to give people to move around without cluttering space, which increases risks of trips and falls. There should be ramps in preference to steps, elevators, and wall-mounted hand rails in hallways and bathrooms. 2. Functional, Easy-Clean Surfaces. Surfaces are of extreme importance in an aged care facility. While they need to be aesthetically pleasing, they also need to be functional and easy to clean. Wilsonart is one great example of a durable solution that is long-lasting and easy to maintain. Decorative Panels are ideal for wall panels, bedheads and cabinets. Compact laminate is the best solution for high usage and wet areas, like bathroom partitions. Laminate is great for any furniture including tables, reception area and worktops. And all Wilsonart products come with extensive warranties, second to none quality and trendy décors to suit any style and design. 3. Community. Communal areas are very important for people to connect with others and enjoy social interactions. Whether it is a communal dining room, a communal space to relax, or an activities room, a bright and welcoming space with comfortable seating that supports and encourages interaction will enhance the lives of residents. 4. Natural Light. Natural sunlight is a mood booster. While it’s important to also have highly functional artificial light with a range of brightness settings available, access to bright natural light as much as possible is crucial for health and wellbeing. Choose large windows, skylights, and offer outdoor and safe balcony areas. 5. Considerations for Dementia Sufferers. A significant number of older people will suffer to some degree with dementia. The right interiors can help with this – for the person as well as for their carers. Bright light, strong warm colours in the interior, high performing flooring and some other simple things will make life of people with dementia much easier. Aged care facilities, instead of feeling like hospitals, need to look and feel like “home”. Interiors need to be fresh and clean, and pleasing to the eye. Older people wish to live their normal lives, as they have done before, as independently as they are able yet in a safe and structured environment. With the right environment through great interiors as well as respectful care and a sense of community, older people will live happier, more fulfilled lives.